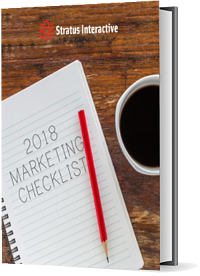 Download Your 2018 Marketing Checklist! 2017 is over! How does your marketing plan look? A defined, goal-driven marketing plan is a roadmap to moving the needle on your growth and brand objectives and keeps you focused on the activities that matter most this year. Is your marketing plan finished? Are you hopeful about it or feeling overwhelmed? We created a list of 16 marketing must-haves for 2018 that will help you build or fine-tune your plan of action and get started quickly. Fill out the form, and get started with your 2018 Marketing Checklist today.